This letter is to provide reference for the fantastic service we have received from FiltaFry. We have been utilizing the service for quite some time now and have noticed a significant reduction in oil usage. Our fryers are not only filtered, but cleaned and polished. This ensures maximum oil life and maintains high food quality. Because of the limited need to have our staff touch the oil, we know there is also a reduction in personnel risk. 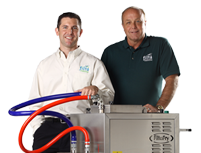 My staff and I are very satisfied with the professional and reliable service the Filta team provides.